As shown on JTV! 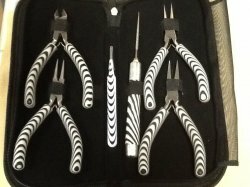 Full size pliers with non-slip grips in a zebra stripe! This high quality set includes sharp side cutters, round nose, chain nose, flat nose pliers, a set of sharp point tweezers and a bead reamer with 3 inter-changeable tips. All in a cool Zebra striped zip case is in high sheen black and silver. Piercing and setting tool for cold connections. Includes a Domed Base for use with rings and other curved surfaces. 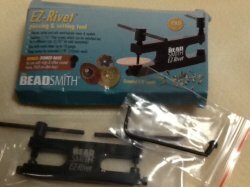 YouTube video of tool in use: thr BeadSmith EZ-Rivet.